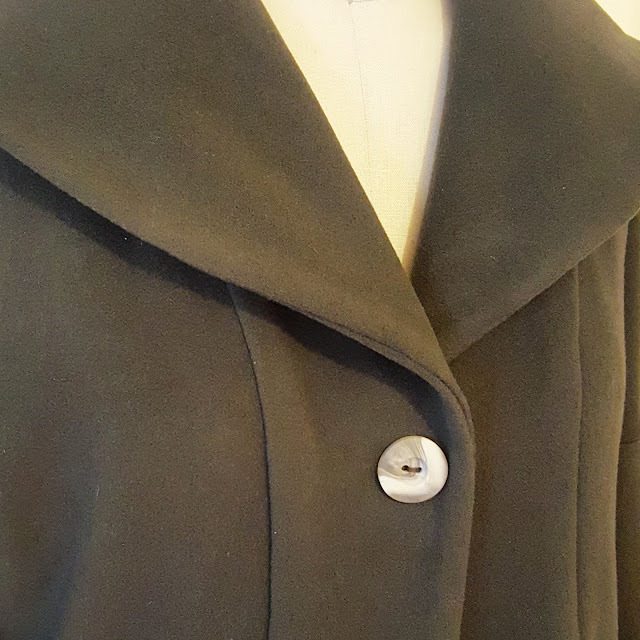 Fabric Mart Fabricistas: Made by a Fabricista: The Lisette Shawl Collar Coat (Butterick 6423) in Wool/Cashmere! 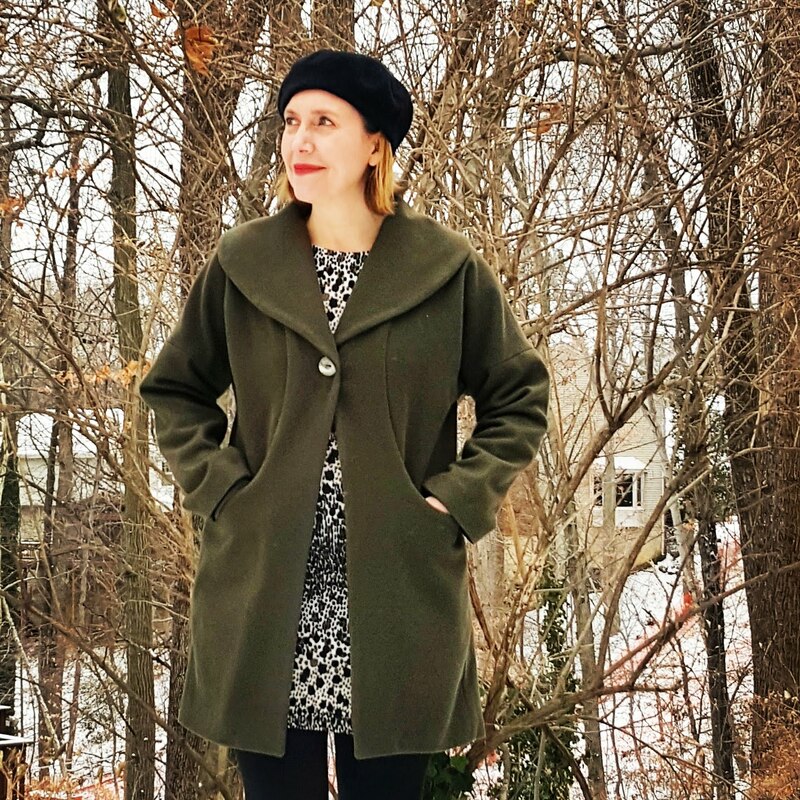 Made by a Fabricista: The Lisette Shawl Collar Coat (Butterick 6423) in Wool/Cashmere! It snowed just in time for my coat debut! I am so glad to be back here on the blog writing about one of my latest makes (and because I am so busy with teaching middle-schoolers, one of my only makes of late)! 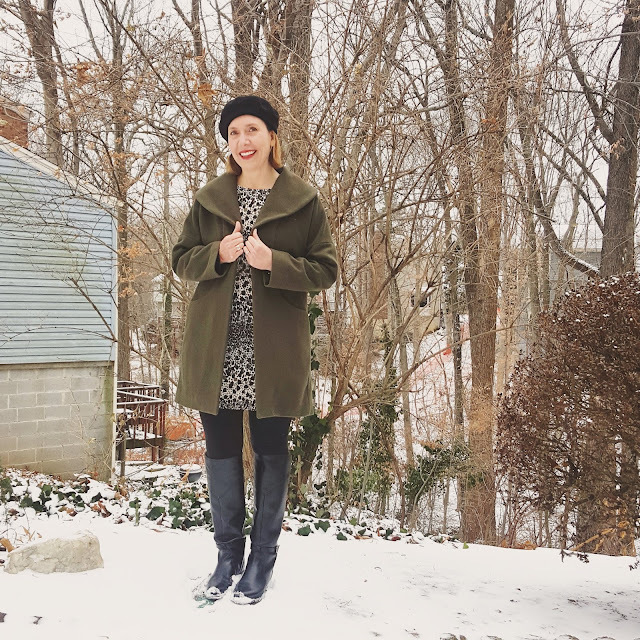 I was asked back in September what I wanted to make for my November make and I declared... a coat ... in wool-cashmere ... and then ... whomp whomp, my sewing machine tanked and I had to get it fixed. 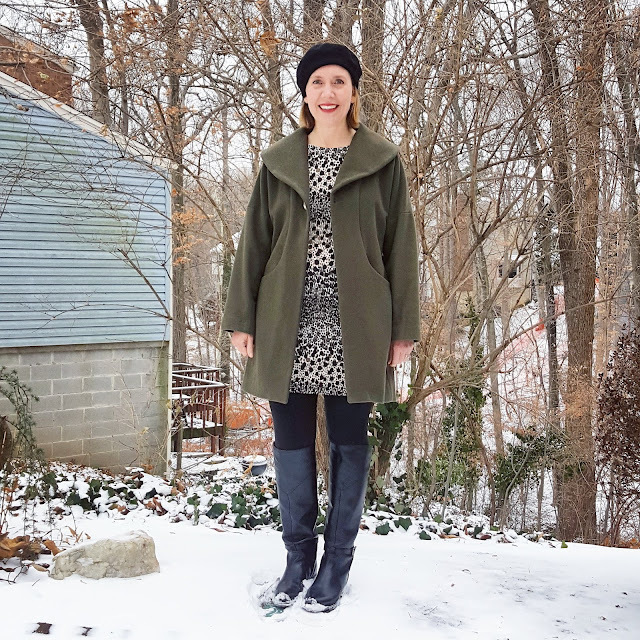 Fortunately, I could use my serger, so I was able to write up a post on these dresses I made, and pushed back my coat post to January, giving me time to finish all of the coat up. I spied a luscious wool/cashmere blend in a very lovely army green color*, and made a plan to make it up in any coat that would suit this somewhat heavy felted wool best. 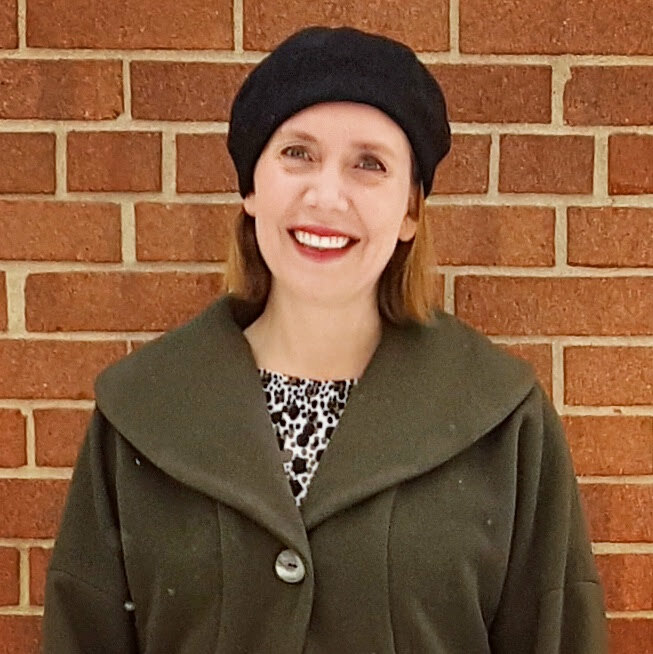 In the end, I chose a Butterick Lisette pattern (Butterick 6423), since it really makes quite a statement in a solid color, what with its huge shawl collar, unique pockets, and slightly flared opening below the button closure. It looked to be equally at home with jeans as well as pretty dresses, so I liked its versatility. 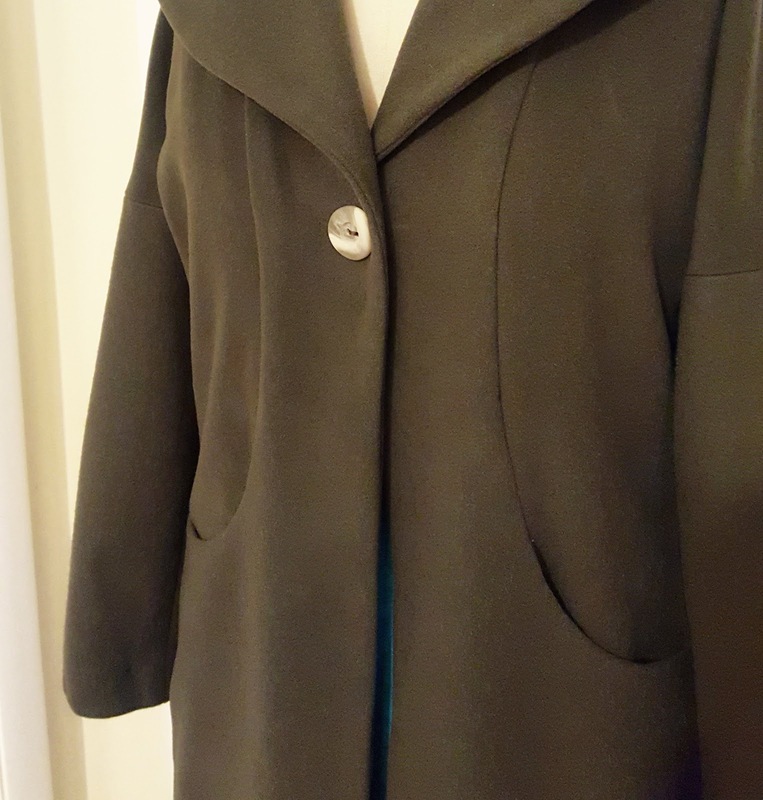 The process of turning this fabric into this coat was not without some difficulty. Liesl doesn't dumb down her patterns, so the details take time, including the very special pockets (much like on her Portfolio dress, which I made here). To create those, you must take special care to very precisely mark out the big and little circles (I used a white chalk pencil with this fabric) and line them up with the fabric's marking from its seam partner. They are princess seamed pockets, so there is also some staystitching and clipping into the curve to make them match up work, too. But the extra effort is very worth it, as it proves to be an easy enough sew (if marked precisely), as well as satisfying, as these pockets are deep and placed exactly where they should be for maximum comfort for use. I also ran into some issues with the neckline directions at the back where the back collar meets the back shoulder and the upper back neck seam. There is a square-shaped corner, and when attempting the original sew on the wool/cashmere, I found that my marking was off, and after ripping the seam out two or three times, I found I had worn down the seam to the point where I had to add a ribbon stay on the outside of the seam (in a contrasting lime green grosgrain ribbon) to strengthen the seam after my mistakes. It works, and it helps provide a bit of extra weightlifting on this heavier coat. Please do remember to carefully mark these seams, too. 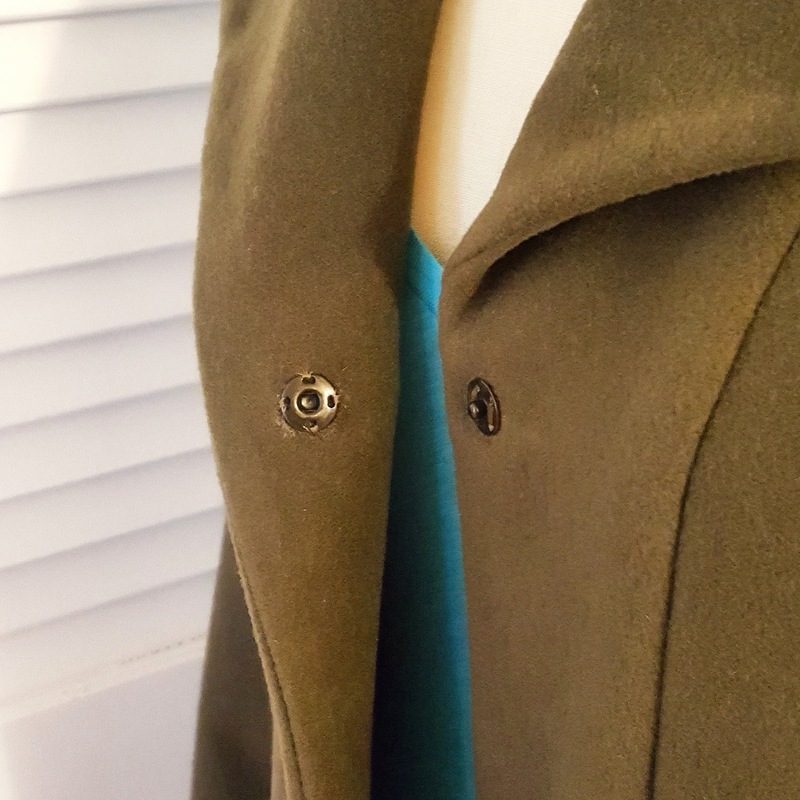 Once I moved to the lining version of this portion of the coat, I did much better, and it didn't require any extra stay tape to keep the seam solid. The lining is almost as delightful as the outer fabric. 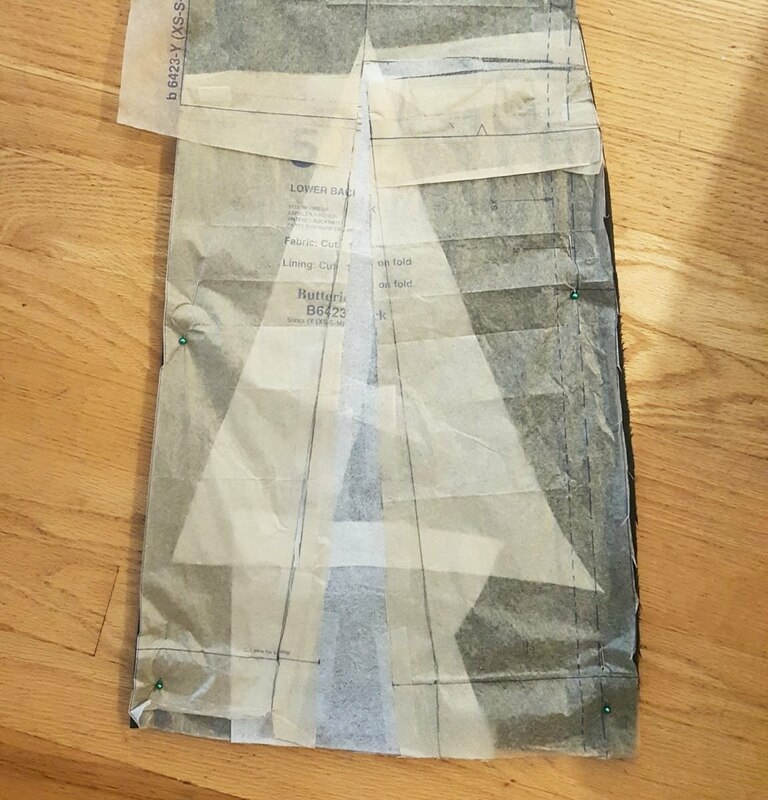 It is from a couple of years ago, when Fabric Mart was selling a high end designer's fabrics, including a beautiful silky rayon acetate blend lining in the same exact olive green color. It was meant to be. :-) It slides well over my clothing, and feels so luxurious next to the wool/cashmere. The two fabrics together feel very expensive, and had I not made my coat, I would have had to spend a lot more to get this in a store. I have fairly large hips for my frame. I wear a size 10 pants but only a 6 top, so I know that with all patterns, and especially Lisette patterns (she seems to pattern for a flat-butted/small hipped lady, lol), I have to adjust the pattern to work with my frame. The top half would be fine in a size small, but I knew even grading out to size medium wouldn't be enough to fit me properly, so I did a cut/slash method to expand the size medium closer to a large. Crazy thing, though, even with that change, I STILL have the effect of the triangle slit below the button closure in excess. True, the model (and most reviews I have seen of the pattern) also has the triangle slit thing going on, but it is most obvious on my version. 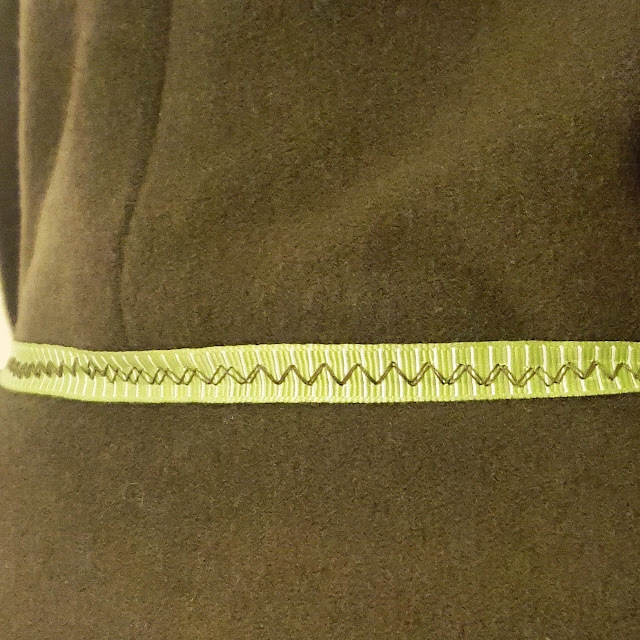 I also did not care for the pleat thing in the back, so I just nixed that and cut the entire back on the fold. I actually really like the back, it is simple but elegant. 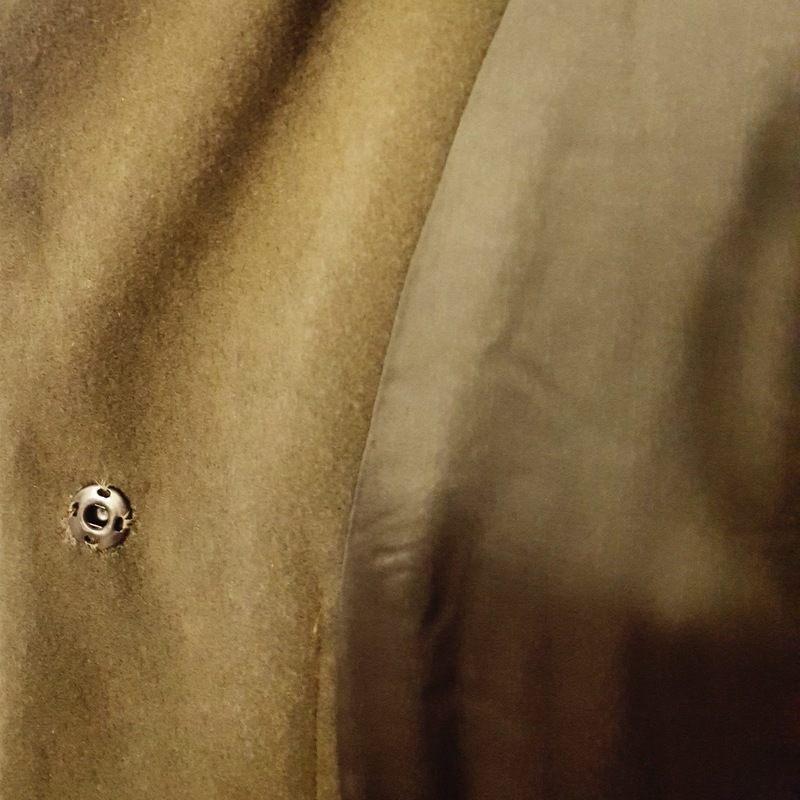 One other thing I did was to use a snap closure (with a button front) instead of a button and buttonhole. This fabric is thick and though I could have tried a buttonhole on the machine, I preferred to just stitch on the button and then create the snap closure underneath. It's perfect and doesn't fly open...and it is easier to open with gloves on! Well, I hope you all are staying warm. I know I am. :-) I have a new coat to prove it. Have any of you tried this pattern? Have any of you ever made anything with wool/cashmere? I would love to read about it!!! So definitely comment! Have a lovely weekend...be back in March! Your coat is beautiful! I love the style lines. 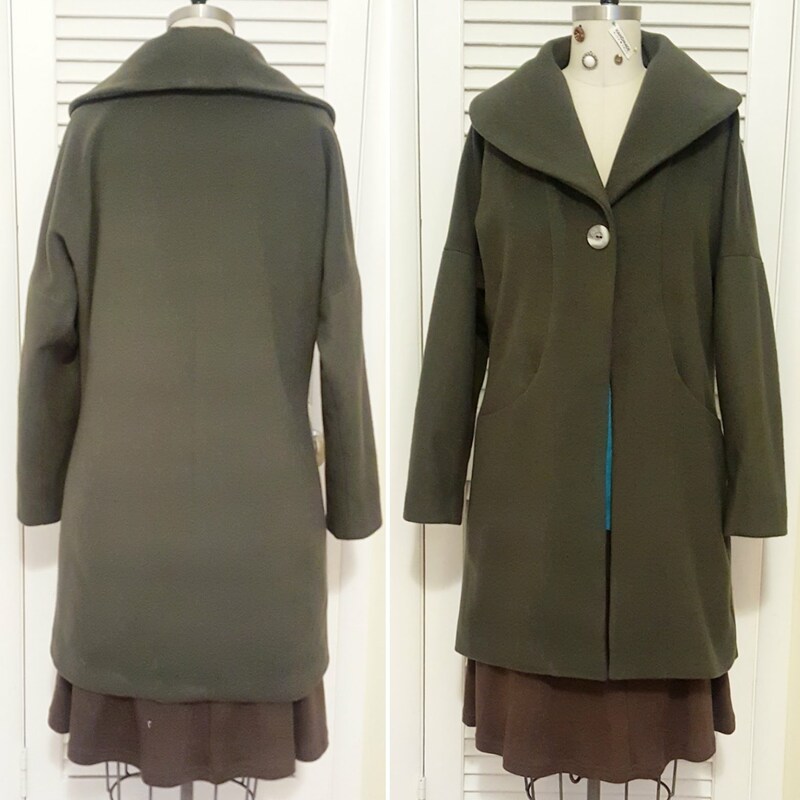 I made a jacket (Grainline Morris) in cashmere and it was a dream to sew! I didn't have any problems except the Morris isn't a lined jacket and it is a bit of challenge to get on and off. If I were going to work with again I would definitely be looking for a lined pattern. Just perfect! Thanks for the details about your working through the fitting. Like you say, great fabric from Fabricmart! I love this store! Thank you so much for sharing your experience. I bought some of that coating and have been scouring patterns suitable for the weight. This pattern appears to be a winner. Thanks for the review! I recently purchased some wool/cashmere from Fabric Mart for this pattern too. A trip to Joann's for the pattern today and I'm ready to go. Dina your coat is gorgeous! I would wear the heck out of it. I love the pockets and interesting style lines, although I’ve never worked with wool cashmere, I’ve had the pleasure of working with 100%wool and love it. Thanks for inspiring! Elizabeth...It was your pattern you sold me (the portfolio dress) that began the love affair with these kinds of pockets! You need to buy this pattern and make it!!! love your coat Dina! I have used sweater knit from wool/cashmere and love it! I would wear your coat until it is threadbare and I looked like a pauper....it is that awesome! 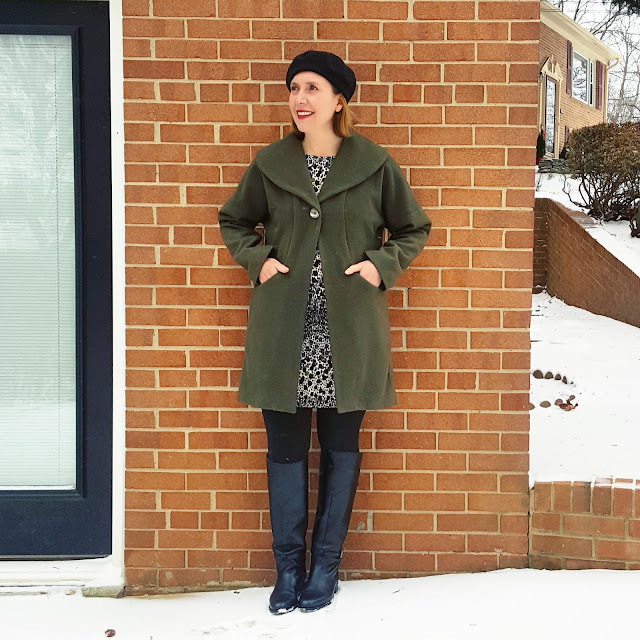 Enjoy wearing this great coat! Thank you, Sue! I would love to make something from a wool cashmere knit...that sounds luscious, and warm! I have a few yards of charcoal wool/cashmere I have finally selected a pattern for. It seems as if it will be very easy to work with, although is deceptive in it's thickness - I am sure it will "thicken up" as I sew with it, and so I am trying for a simple style such as your choice here that will not require too many details, crossing seams, etc. I love, love your coat! I agree with the other comments, I would wear the heck out of that coat! Oh I love this! I have that pattern in my stash. Definitely make it!!! Would love to see another version!